The period initially covered by Arts:Search is 1919-1928. Available soon. 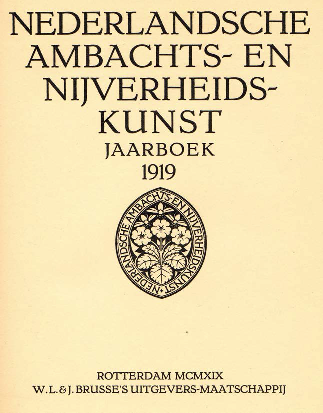 Title varies The yearbook of the Nederlandsche Vereeniging voor Ambachts- en Nijverheidskunst [Dutch Association of Craft and Decorative Arts] (VANK), founded in 1904. The yearbooks are an important source on contemporary Dutch decorative and applied art as most of designers and craftspeople working in the Netherlands at this time were members of VANK. Each issue of the yearbook contain brief reports on recent developments in Dutch design followed by between 70-100 pages of photographs of work by members of VANK, including interiors, furniture, ceramics, glass, jewelry, art metalwork, stained glass, wallpaper design, posters, graphic art, book design and textiles. Artists whose work is featured include Gerrit Rietveld, Willy Sluiter, Jan Toorop H. Th. Wijdeveld, C.A. Lion Cachet, Piet Zwart, Theo van Doesburg, Johan Thorn Prikker, W.H. Gispen, Willem Penaat, H.P. Berlage, etc.